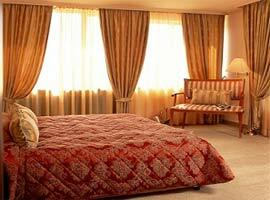 Situated in the centre of Plovdiv, just 5 minutes walking from the Plovdiv International Fair. 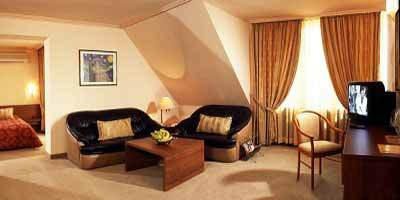 This high class hotel offers 28 double and single rooms and 6 apartments. 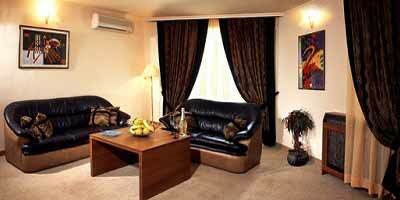 Each room is furnished with comfortable bed, direct phone line, TV-set and well supplied mini-bar, all air-conditioned. 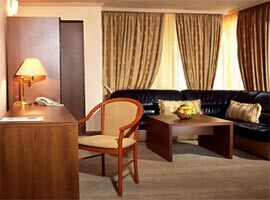 Day & night room-service is available. Parking lot - free of charge. Safe deposit boxes - free of charge. Sauna and fitness center - free of charge. Massage - if you prefer, it can be ordered even in your room. Restaurant with summer garden - opening hours from 11 a.m. until 11 p.m. Offers local specialties as well as international cuisine in the pleasant atmosphere of live music. 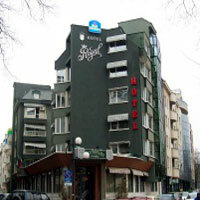 The elegant hotel restaurant is a good example of the Bulgarian hospitality. 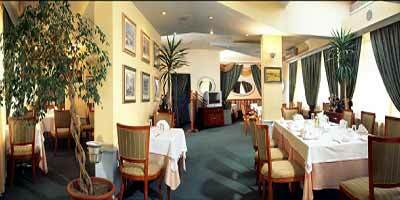 It offers local specialitie as well as refined international cuisine in the pleasant atmosphere of of live music.